I don't know what came over me, but I decided to forgo my everyday make-up for a holiday navy eye. A bit dramatic for my trip to the grocery store, but perfect for any upcoming holiday parties or winter nights out. I wanted to start with a full-coverage flawless base since theoretically I would be at previously mentioned holiday party. I used the Nars Radiant Cream Compact Foundation in the shade Siberia with a BeautyBlender. My perfect match is Mont Blanc, but I ran out of that shade so I mixed a teeny bit of Tarte's Amazonian Clay Foundation in Light, since that one is a bit dark and is also full-coverage. To start the eye look, I applied Urban Decay's Primer Potion. For the eyes, I mainly used the Sleek i-Divine Eyeshadow Palette in Storm. First, I took the frosted champagne shade and applied that to a little over half of my lid, in the inner corner, and on the first half or so of my lower lash line. Next, I took a bit of the first gold shade on the same brush and placed that on the center of the lid, just for some added dimension. I made sure to blend these two shades very well. Flipping my brush over, I took the gorgeous navy blue shade from the same palette and applied that to the remaining part of my lid, roughly creating the shape I wanted. I then used a smaller brush to more precisely add the navy to form the outer-V shape and apply below my lash line. At this point it looked a bit crazy, so I used the lighter matte brown shade from the Sleek palette as a transition colour, applying that with a fluffy brush. I added a bit of the matte black to the outer-v to deepen it up, just a little more. For under my brow, I used Foxy from the Urban Decay Naked 2 palette. Next, I lined my eyes with liquid liner. I use Jordana Fabuliner for the line, Wet 'n Wild H20 Proof for the flick, and set it all with Blackout from UD Naked 2. I lined both my waterline and tightline with the Sumita eyeliner in Black. Finally for the eyes, I curled my lashes and applied a generous amount of tarte Gifted mascara. For my eyebrows, I wanted them to be on the bold side to work with the dark shadows. I used tarte's the Brow Architect to fill in a strong shape. I then concealed under my eyes using the Nars Radiant Creamy Concealer in Vanilla. I contoured using the Sleek Contour Kit in Light. For blush, I used NYX Dusty Rose. As a highlight, I went all out with theBalm's Mary Lou-Manizer. It's crazy shiny. For lips, I went with Urban Decay Super Saturated Lip Pencil in Lovechild, for an easy pink. And that's it! If I had really been going to a holiday party or out-on-the-town, I would dose up on an Urban Decay setting spray. So I am really feeling the holiday spirit! I think this is a perfect winter glam look. I'm getting a Snow Queen, Ice Princess vibe. It's fun to go a bit intense with the make-up, even without an occasion. 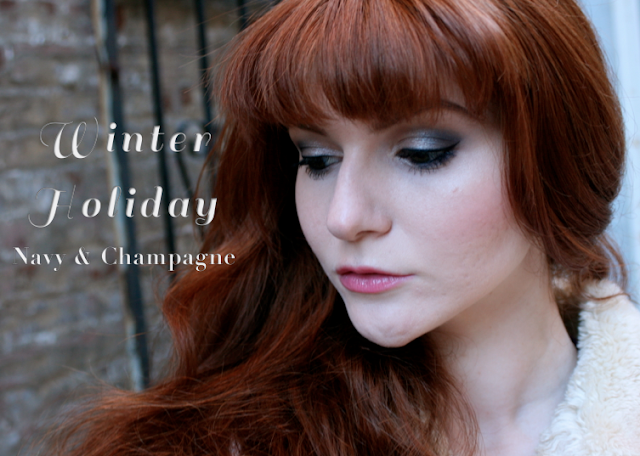 I will definitely be posting more holiday-inspired looks in the upcoming weeks! What are some holiday looks you would like to see next?